In 2008 people in Japan were astounded when newspapers revealed the story of a homeless woman who had managed to slip into the apartment of a meteorology worker and live there undetected for a year. She was discovered only when, suspicious about the disappearance of food from his fridge, he installed an video surveillance camera. 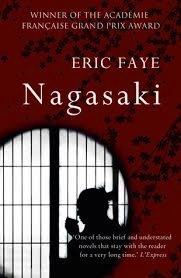 This real life story forms the basis of Nagasaki, a novella by the French journalist Eric Faye which won the Académie Française Grand Prix du Roman in 2010. He could have written it as a thriller in which the mysterious events experienced by the apartment owner have a menacing tone. Instead Faye turns this curious incident into a much more interesting reflection about loneliness and the way in which people can just drop unnoticed through the chinks in society. Imagine a man in his fifties disappointed to have reached middle age so quickly and utterly, residing in his modest house in a suburb of Nagasaki with very steep streets. Picture these snakes of soft asphalt slithering up the hillsides until they reach the point where all the urban scum of corrugated iron, tarpaulins, tiles and God knows what peters out beside a wall of straggly, crooked bamboo. This is where I live. Who am I? Without wishing to overstate matters, I don’t amount to much. As a single man, I cultivate certain habits which keep me out of trouble and allow me to tell myself I have at least some redeeming features. Initially resentful of the woman, he begins to sympathise with her and to understand how circumstances had forced her to take refuge in his home. Even so, he cannot bear the thought of remaining in this apartment which will forever now be tainted by her presence. His experience opens his consciousness to his city’s history, seeing a parallel in the way it had tried, but failed, to protect itself from intruding foreign traders hundreds of years earlier. The woman’s intrusion also causes him to question his life and to see it more clearly. Watching news reports about the trend in creating robots to look after the country’s ageing population he sees that his fate is to die alone with only a robot to care for him. Having pulled us so effectively into Shimura’s world, Faye leaves us dangling while he introduces the perspective of the other party in this human drama, the intruder herself. In the second part of the story we get to hear of the sequence of events, including the effects of Japan’s deep economic recession at the time, that led her to find shelter in his home. Faye shows not only how someone’s life can cycle downwards until they have no place to go. As interesting as it was to understand why she ended up in the apartment and the painstaking efforts she made to keep her presence secret, it was Shimura’s story that held my interest more and was written more compellingly. This was overall however an excellent story which makes you think about your own future in old age and how many other people there are as isolated as Shimura or as desperate as his unwanted houseguest. A chilling thought..
Nagasaki was published in English in 2014 by Gallic Books, translated from French by Emily Boyce. Posted on September 27, 2014, in French authors and tagged Eric Faye, French authors. Bookmark the permalink. 23 Comments. this sounds really good! Adding to my pile now, thanks Booker! L.
Wow, this seems to be an engaging story, and just reading your thoughts reeled me in. I could feel for the characters, especially that lonely man whose life is about the minor annoyances like cicadas and disappearing food. Thanks for sharing! I’m excited to find one in my country bookstore. Thanks! This sounds fascinating. Why didn’t i hear about this story (the real one) when it happened? I heard about this story–and was fascinated by it–when it was in the news. I had no idea someone turned it into a novel. Look forward to reading it! This is the third time I’ve learned about a new book from your site and have never been disappointed. Thanks! Wow. Lately my reading tastes seem a bit jaded. Not enjoying my reading, not finishing books. But this one has captured my interest. And thanks to the Resurgent Bookworm for finding the newspaper account. My local library doesn’t have a copy of the book so I’ve been to ibooks and read the sample pages which they give and I can’t wait to read the whole book. It is now sitting on my mini ipad just waiting for me to get some chores done first. Thanks for explaining the book. And now I’ve read it and am so pleased that I have. A delightful writing style and some praise for that must go to the translator, Slowly but surely I began to feel for the meteorologist, trying to explain the unexplainable and having to prove to himself that it wasn’t his imagination And in a different way explaining the unexplainable about his visitor. Though only a novella it would fit well into a book club list as it opens up so many areas of discussion . The only thing I need to follow up is how well the author knows Japan to write about this lifestyle Why not set the story in a her familiar culture. It could have happened anywhere. I looked at my house in a different light after reading this book !! What an incredible story. Do you know what happened to the woman in real life? in the book she goes to prison but I won’t say anything more than that because it could spoil the reading. In real life, I simply can’t find the answer to that question. All the newspaper reports seem to stop at the point of her arrest. But I have work colleagues in Japan who might be able to cast some light on it…. thanks for that – there were many reports worldwide about the discovery but so far I’ve not seen anything which says what happened to her subsequently. True …. article said she was booked for trespassing. The sheer oddity of the story draws you in ! 😀 I guess we may never know though !